Within these pages knitters will find a fascinating survey of the history of sock knitting; basic and advanced techniques for top-down and toe-up socks; everything they need to design their own socks. 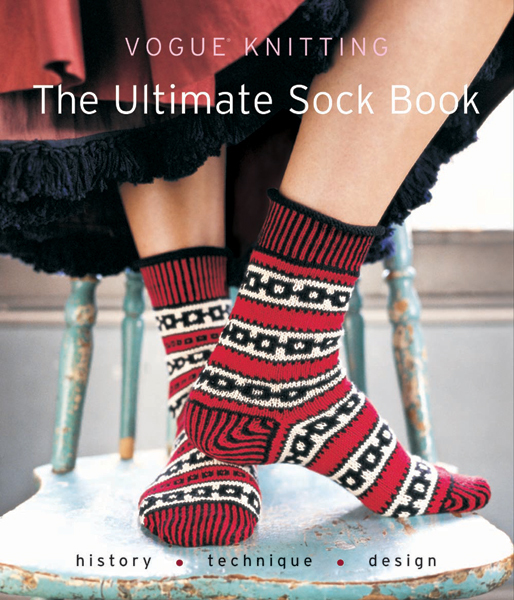 Announcing the most definitive guide to sock knitting available today, by the editors of Vogue Knitting magazine. Who but the editors of Vogue Knitting magazine can bring you the ultimate guide to the most knitterly of skills? Much more than a pattern book, this volume introduces novices and experts alike to the wonderful world of sock knitting. At once a pattern book, reference work, and historical adventure, The Ultimate Sock Book includes everything you need to design your own socks: the Vogue Knitting Sock Calculator, universal patterns for toe-up and top-down socks, a Stitch Pattern Dictionary and a Sock Design Worksheet; extensive information and a handy reference table about sock yarns; and brand-new, patterns for men, women and children. The Ultimate Sock Book gives knitters of all skill levels everything they need to become practitioners of the ultimate knitterly art.